One question in – just one – and you could feel the tension bouncing between the ornate chandeliers, the Persian rugs and the two microphones about 50 feet from each other: Westbrook near one ballroom entrance, Kevin Durant, near another. Welcome, Uncivil America, to the Showdown at the Ritz-Carlton (aka Friday’s media availability for the Western Conference All-Stars). Oh, it’s on. It is so on. Despite Westbrook’s best efforts, it’s not Fashion Week at NBA All-Star Weekend. It’s Feud Week, baby. Heck, it’s The Year of the Beef. Remember the era of pull-in bro hugs and hanging with your boy at the club even after he dropped 40 on you in a loss? Yeah, well, it’s over. Fraternization is out. Nasty rivalries are back in. We got your ex-teammate-on-ex-teammate feud (Russ vs. K.D. ), your current-teammate-on-current-teammate feud (Dwyane Wade vs. the Bulls’ scrubs), your Round Mound of Pronoun-on-Reigning Champion feud (Charles Barkley vs. LeBron James), your Team President-on-Player He Wants Gone feud (Phil Jackson vs. Carmelo Anthony), your Eastern Conference runner-up tilt (Jae Crowder, Marcus Smart and the physical Celtics players can’t stand John Wall and the showy Wizards), your Persecuted Hothead-on-Ref feud (this is also referred to as DeMarcus Cousins vs. Himself) and, sadly, your Garden variety Petulant Owner vs. Popular Legend feud (James Dolan vs. Charles Oakley). The entire hangin’-with-the-opposing-fellas NBA has suddenly become Biggie vs. ’Pac – without, like, mortal wounds or anything. And you know what? It’s good for the league. They need more rivalries, more personal beefs, more hurt feelings and fewer fist-pounds win or lose. Not, of course, the ugliness we saw at Madison Square Garden last week with Oakley being taken down by security guards. But genuine, on-the-court competitive dislike. It not only breaks up the monotony of an 82-game season and builds toward the playoffs, it camouflages the NBA becoming a Golden State/Cleveland/Everybody Else league. It’s also what fueled the NBA’s golden era. Larry Bird and Magic Johnson came to be great friends, but for many years each would have died happy if they could only beat each other. The Detroit Pistons’ disdain for Michael Jordan had as much to do with the Chicago Bulls becoming a dynasty as anything. Chicago had to go through a minefield to get to the NBA Finals almost every year. Julius Erving and Bird once engaged in a fistfight – at the start of the season! Things haven’t gotten that ugly here in New Orleans. Still, there’s plenty of possibility. At any time Chuck and ‘Bron might end up in the same elevator and maybe only one will exit. K.D. and Russ having their lockers next to each other again is a powder keg waiting for a match. And Oak, here visiting friends, and Dolan, attending the NBA’s tech summit, could run into each other after hours. Here in the Big Easy, everything feels hard – even showing up to talk to the media about all the unpleasantness. But, God bless him, Russ showed. And for eight of the most disciplined minutes of his career, the first man to average a triple-double this late in a season since Oscar Robertson hilariously deflected any and all questions about Durant, his former BFF-turned-nemesis, hiding behind Fashion Week to offset the gauntlet of K.D. inquiries. It was spectacular. 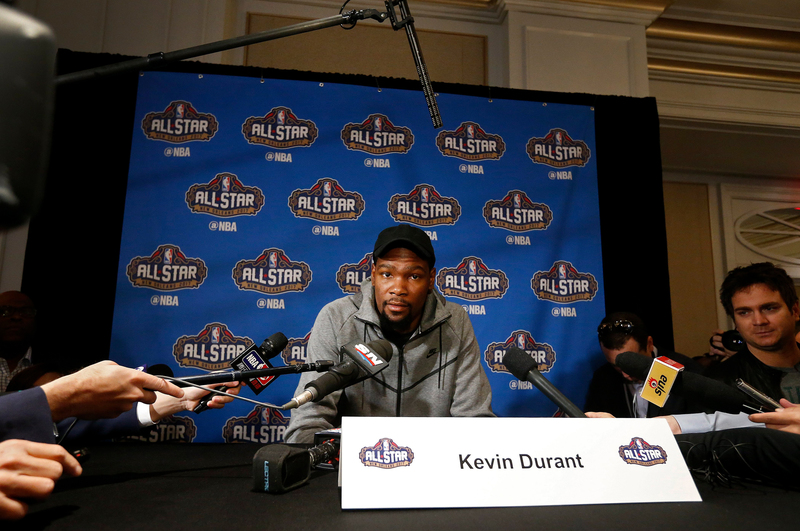 Golden State Warriors player Kevin Durant speaks to the media during NBA All-Star media availability at the Ritz Carlton in New Orleans, Louisiana, USA, 17 February 2017. OK, so none of this rises to the level of Shaq vs. Kobe, still the all-time greatest NBA feud because it divided not just a team and an entire fan base but a country of hoopheads. And I would put Kevin Garnett and Paul Pierce shunning Ray Allen after he left the Boston Celtics for the Miami Heat several years ago above most of these recent donnybrooks, because K.G. and The Truth are so petty they still haven’t talked to Allen. But as former Big Threes go, the one here has the potential for lifelong ill will. It’s the first time, after all, that Durant, Westbrook and James Harden will all play on the same All-Star team while with different franchises. I asked Harden if, as their former teammate, he felt any responsibility to mediate Russ vs. K.D. Harden grew up with Westbrook in Los Angeles, so he’s always been closer to him. Harden tried to get Durant to make a free agent visit to the Houston Rockets this summer and he didn’t. It irked Harden that Durant wouldn’t visit. There’s a respect there, but that relationship isn’t the same. When I asked Durant if he and Harden are on the outs, too, he gave me a sideways look and added, “Who told you that?” Someone who would know, I said. After The Showdown at the Ritz ended and the Oklahoma City Thunder’s former Big Three went their separate ways with their separate entourages, you realized how odd it was that they would have to pass to each other in the actual All-Star Game on Sunday.